Baby-themed games are an essential part of baby showers. Many baby shower games are exceptionally on-theme (candy poo game, anyone?) and can be embarrassing for some guests. But how can you have a baby shower without a fun game? We have a solution: the rice and safety pin game. Before disposable diapers rose to popularity, safety pins were always used to fasten cloth diapers. Of course, now that cloth diapers are coming back thanks to environmentalism and the desire for less waste, safety pins are a staple for soon-to-be mamas. That’s why this rice and safety pin game is so fitting for baby showers. This game may seem incredibly simple, but it’s more difficult than you think. It's certainly a test of your senses. The only way for you to find out if you have what it takes to win is to try it yourself! This game is exciting, simple and, best of all, fun for all ages and abilities. You only need a few basic supplies to get started. Possibly the best part about this game is that it requires just a few simple items and it's incredibly easy to prepare. You don't have to spend a lot of money on the supplies, and you might already have everything you need. This means you can spend more of your shower budget on other things like delicious food and decorations. In the baby shower rice game, you’ll need to differentiate rice and safety pins by feel. With that said, long grain rice works best if you want to make this game challenging. Bonus: it’s typically cheaper at the grocery store compared to short grain rice! You can use a large mixing bowl to hold your rice and safety pins, as shown here, or a gallon-sized ziplock bag. Mixing the safety pins and rice in a bowl means some might spill out, so use the largest bowl you have to keep things clean. Using a sealable bag will allow you to secure it shut before mixing, which may be a less messy route. If you do use a bag for your rice, consider double bagging it to ensure none will spill. This may go without saying, but the rice you use for this game shouldn’t be reused for cooking later for hygiene reasons. To prevent the spread of germs, ask players to wash their hands with warm water and soap beforehand. Safety pins range in sizes and often come in assorted packs, which work well for this game. The larger the safety pins, the easier it is to find them, so mixing sizes up adds a challenge to the game. You want about 2-3 times as much rice as safety pins for this game. If it looks like you need more rice after you add the safety pins, simply add more rice and mix them together again. The more rice you have, the bigger the challenge. Be sure to double check that all safety pins are securely fastened shut. You don’t want players to accidentally poke themselves. Newly-made safety pins are generally reliably safe – just like their name implies – but avoid using old pins, especially if they’ve developed rust. Now that you have your rice and safety pins well mixed in your bowl or bag, it’s time to play. The blindfold is optional and, instead, players can simply close their eyes if they prefer. Ultimately, the point is to not let the player see what their hands are doing during their turn. 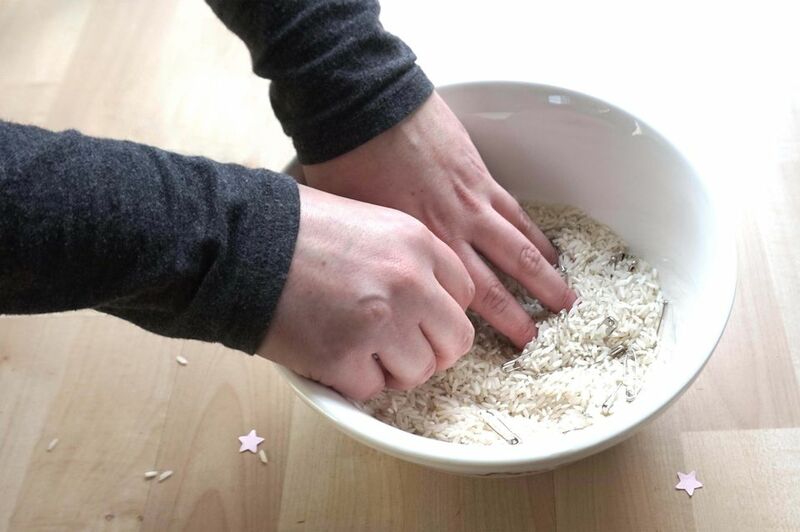 Each player gets 60 seconds to dig their hands through the mixture of rice and safety pins in an attempt to differentiate between the two. The goal is to find as many safety pins as possible before the timer goes off. When players find one, they should pull it out of the bowl or bag and place it near them to easily count when they’re finished. After they’ve counted their lot, place them back into the mixture and mix everything up again. Then, it’s on to the next challenger! After everyone has had a chance, the player who found the most pins wins. You can choose if you’d like to stop after one round or keep going – best two out of three? Up the stakes by giving away a fun prize to whoever wins. Let the games begin! There are many more entertaining games to play at baby showers. Create multiple game “stations” and have guests rotate among different ones to liven up your party.